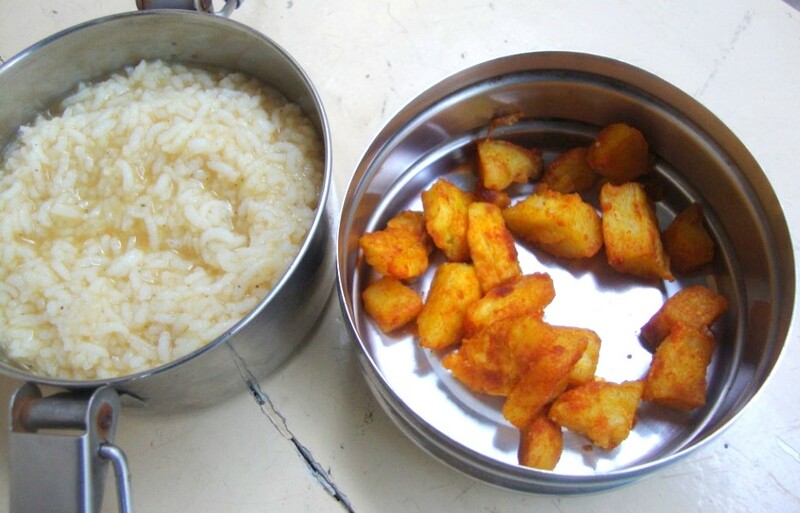 During school days deciding to send dishes like Sambar Rice or Rasam Rice, is not only filling, also convenient for your own cooking menu. 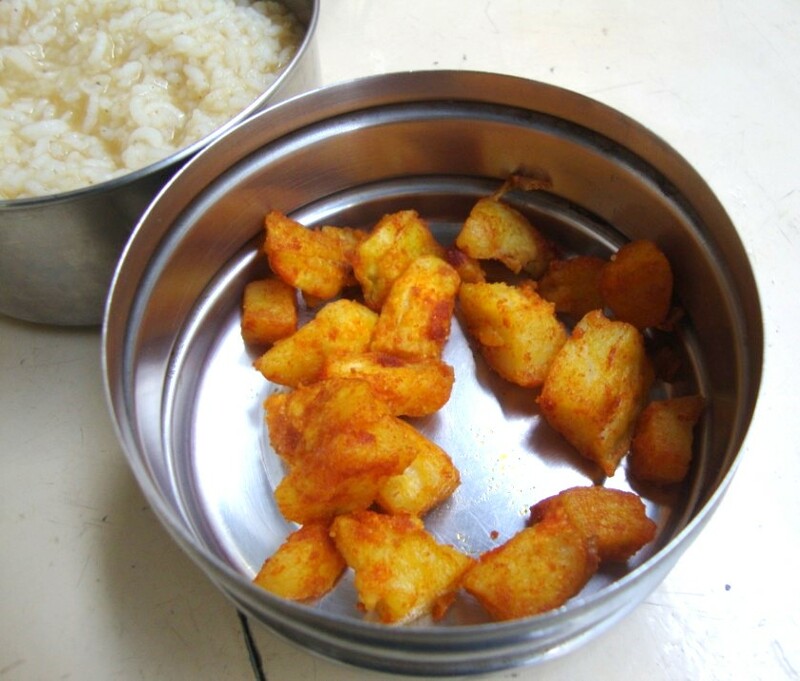 I try to send Sambar or Rasam Rice for the kids. For Konda, it’s always a side dish of potato roast. As such making a roast with just one big potato for her is easy enough. 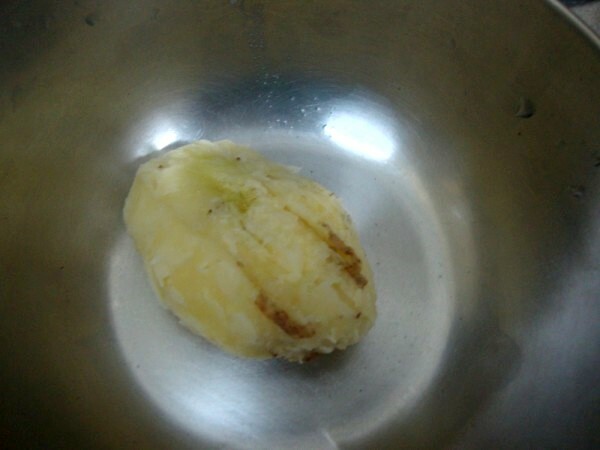 I simply microwave the washed and slit potatoes for 6 mins, immerse in water and peel to roast it. But the other day I was even more hard pressed for time, I thought a simpler way of roasting it in microwave will be handy. So this simple method proved very helpful. You simply don’t have to worry about the potatoes getting burnt. It’s been a long weekend for the boys as they had a cultural program. I didn’t think I was up to getting them practice or dress up with a different costume. So for the non participants they had the day off. Just imagine 4 long days of holidays. They couldn’t find enough games to keep them occupied. Another week will start and I got to plan well for the rush days to come. Do try this when you are hard pressed for time or simply to make other things. Wash and make slits on the potatoes. Microwave for 6 mins. Immerse in water and peel the skin off. 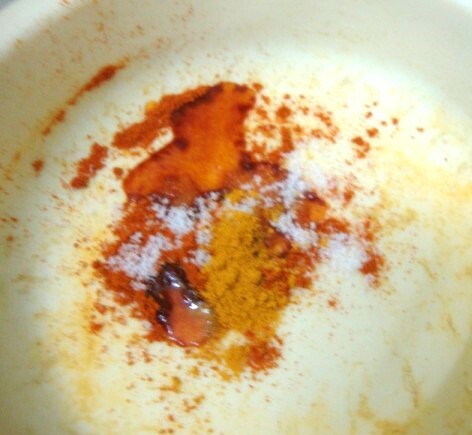 In a microwave safe bowl, add red chili powder, turmeric powder and salt, 1 tsp of oil. Mix well. 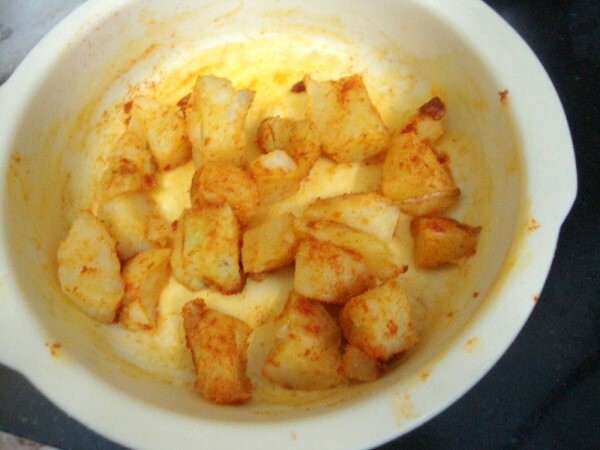 Cube the potatoes into smaller ones, mix with the masala. Microwave for 1 min, if you want it more crispy, micro for another 30 secs. Makes a great combo with Sambar/ Rasam Rice. Sending this to Monika who is guest hosting the MEC themed on Potatoes this month. You seems to do so many fast and easy dishes, this one looks absloutley yumm. I make them often ..yummy..
OMG! that's really awesome recipe!!! Potato roast looks awesome. Great preparation. That's super fast and so yummy. looks lovely. Have to try it. have u used micro wave mode or grill/convention mode for the crisper version. Sorry I haven't really tried it..maybe in convection mode you can get crisper version..in mw way you will not be able to get it.